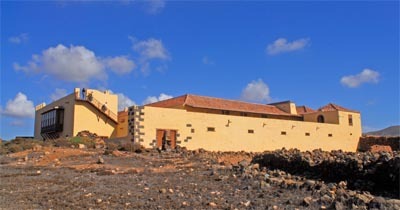 Discover the Casa de Los Coroneles in Fuerteventura. The Casa de Los Coroneles is located in the municipality of La Oliva, near Corralejo, in the North of the island of Fuerteventura, in the Canary Islands. Casa de los Coroneles is a stately building raised in 1650 by the Cabrera Béthencourt family. During the manor period, this building received military colonels and had a great importance from the administrative point of view as well as military, economic and social. It was restored on many occasions yet the most important one was in the XVIII century. Nowadays the Casa de los Coroneles is the most significative domestic architecture in Fuerteventura and one of the most interesting in the Canary Islands. To get to the Casa de los Coroneles it’s advisable to rent a car in Fuerteventura and head to La Oliva through the FV-10 if you’re coming from the south, and the FV-101 if you’re coming from the north. It’s also possible to get here by public transport through the bus heading to La Oliva.